ARTBA Contractor Leaders Visit D.C. 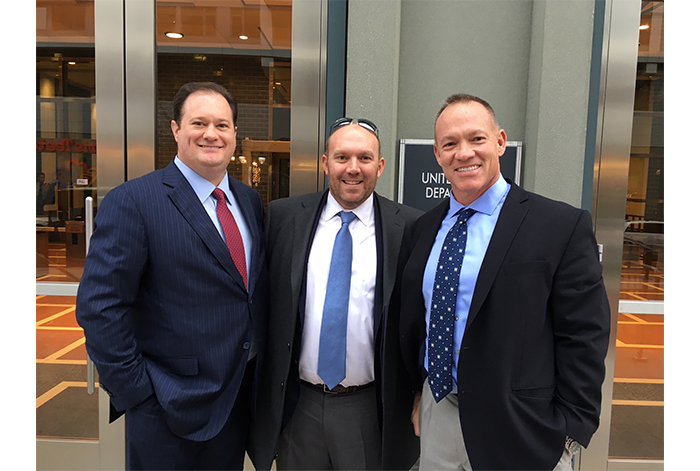 The three officers of ARTBA’s Contractors Division visited the Nation’s Capital Dec. 12 to meet with Federal Highway Administration (FHWA) officials, learn more about the association’s current initiatives and set priorities for the division’s policy agenda. President John Boyle of United Infrastructure Group, First Vice President Dave Zanetell of Kraemer North America, and Second Vice President Michael Vecellio of Vecellio Group, Inc., started by meeting with ARTBA senior staff and reviewing the status of the association’s legislative agenda and other efforts such as the Safety Certification for Transportation Project Professionals™ (SCTPP) program. Later, the officers met with several key FHWA officials, including Acting Administrator Brandye Hendrickson, Executive Director Butch Waidelich, Associate Administrator for Infrastructure Tom Everett and Associate Administrator for Research Hari Kalla. Topics included the status of compliance areas like Buy America and the Disadvantaged Business Enterprise (DBE) program. The ARTBA leaders also emphasized the importance of fully deploying the project-level streamlining provisions enacted in recent federal surface transportation legislation. The FHWA officials also showed a particular interest in the contractors’ perspective on work zone safety and innovation. For more information on ARTBA Contractors Division activities and initiatives, please contact me at rjuliano@artba.org.